Previously, we had made some greeting cards with the Dard Hunter Rose motif printed onto them. The next step was to make handmade envelopes to go with each set of greeting cards, since the cards were a special and specific size. 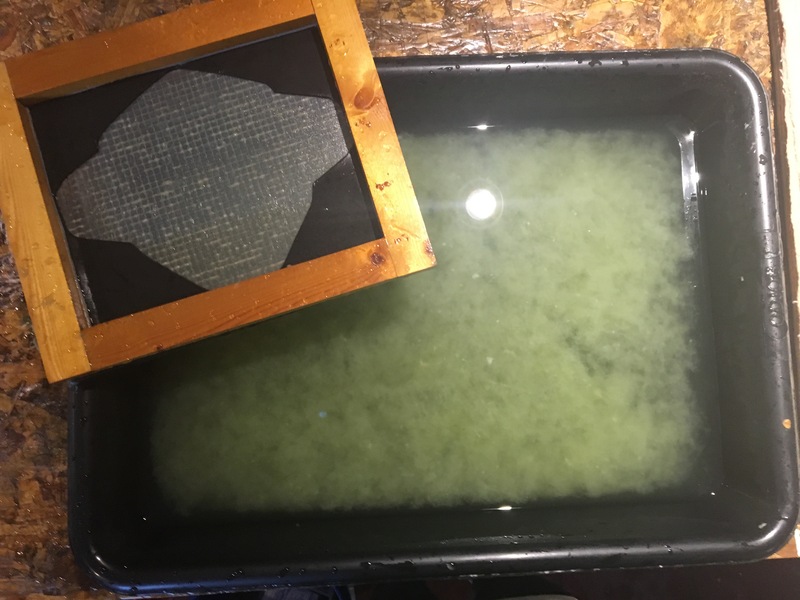 Prior to pulling the paper for the handmade envelopes, we dyed the paper pulp a sage green color, to compliment the deep green and vibrant pink of the Dard Hunter Rose prints. The dye used was the Dr. Ph. Martin’s Radiant Concentrated watercolor dye, since it is able to attach to the paper pulp fibers, allowing for the pulp to turn an evenly toned, muted green color. In order to pull paper in the shape of something easily-foldable into an envelope, Nicole devised a foam stencil that adhered to the mold. By having this stencil on the mold as you pull paper, you’re able to keep pulp from dispersing evenly over the mold, forcing the pulp to lie in a specific shape once you take the stencil off. The envelope is then couched like a normal sheet of paper. It’s a very simple, but effective way to maintain the shape of the paper you’re pulling, if you are pulling any shape that is not the shape of the mold. After all the envelopes had been dried in the stack dryer, we folded and glued them together, making packs of greeting cards and envelopes.